Mazda is introducing six new Sport Venture models all fitted with a new 6.1-inch Mazda Navigation System with integrated Bluetooth. The line-up includes Mazda MX-5, Mazda5 and Mazda2 versions. Each Sport Venture features bright alloy wheels, bright silver door mirrors and two new colours, Titanium Flash and Deep Crystal Blue Mica. 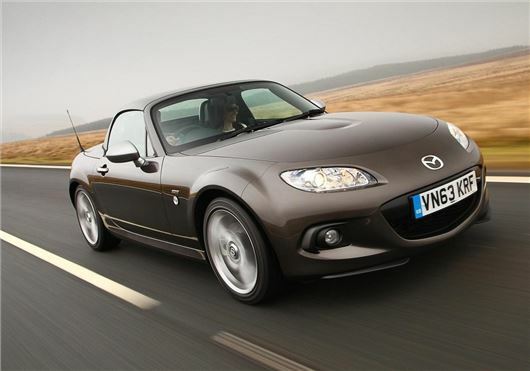 The Mazda MX-5 Sport Venture will be available in three versions, the 1.8-litre 126PS Soft-top or Roadster Coupe with 1.8-litre 126PS or 2.0-litre 160PS power units. The trio will be offered with two new exterior colours and will feature stone leather sports heated seats. Prices start at £18,995, with free of charge Mica paint. The two upgraded Mazda5 Sport Venture models (with 150PS petrol or 115PS diesel power), feature a Brilliant Black front grille, heated power-folding bright silver door mirrors and black leather seat trim with contrasting grey stitching. Prices are £20,295 (petrol) and £21,695 (diesel) with a range of paint colours as a £500 option. The 1.3-litre 85PS Mazda2 Sport Venture model is an addition to the range (based on the Tamura) and is equipped with 16-inch Bright alloy wheels, front fog lights, dusk-sensing lights, rain-sensing front wipers and rear parking sensors. Inside, there’s a leather steering wheel with gloss dark grey inserts, gloss dark grey trim to the audio panel, door trims and outer air vents, electric rear windows and climate control air-conditioning. This model is priced at £13,395 and customers can choose from a selection of nine exterior colours. Until 31 March 2014, all six Sport Venture models are available with zero deposit, 0% APR representative finance when purchased on a Mazda PCP (over 42 months), and a deposit contribution of £500 to £1500 – depending on model.